Share the post "DVD review: DEEP PURPLE – California Jam 1974"
I was beginning to think that ‘remastering’ is a marketing ‘con’ and not about bringing consumers a truly superior product. After all, is it really possible to make a sow’s purse out of a pig’s ear – even in this digital age? Anyway, what we have here is a re-release of Mark III Purple’s legendary performance from April 1974 at the Ontario Motor Speedway in California. Recorded and aired live by ABC-TV, it was one of the first concerts released on video in 1981, and given a fresh lick of paint on its DVD release in 2005 with the addition of the previously omitted ‘Lay Down, Stay Down’. It was one of the early Mark III performances and part of the California Jam Festival that attracted upwards of a quarter of a million people, featured the loudest PA ever installed and a bill including ELP, Black Sabbath, Eagles and Earth Wind and Fire. It remains the premier documentation of the Mark III line up in full flow, shortly after the release of Burn. Tensions – never far below the surface – smoulder and the gig culminates with Blackmore – in a fit of rage with the promoters’ broken promises – trashing his kit, and creating mayhem with an impromptu stunt that saw petrol drenched speaker cabs create an onstage fireball. A truly Spinal Tap moment. We’re told that this re-issue has been ‘restored and newly ‘edited’ for hi-def viewing, and the packaging adorned with brand new artwork and liner notes. Sceptics would say ‘… and just in time for Christmas’. But in this case, it would seem that some loving attention has indeed been paid to the recordings – the screen format may still be largely 4:3, but the picture quality is noticeably sharper, the footage has been significantly re-edited, including some highly effective multi angle layering, and, in places dual angle stitching into widescreen format. For once, the result is as different as chalk and cheese. The sound quality is also excellent. 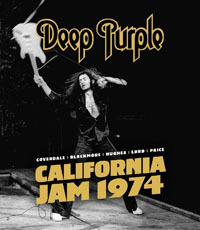 This entry was posted in All Posts, DVD REVIEWS and tagged Bluray, California Jam 1974, David Coverdale, Deep Purple, DVD, Ian Paice, Jon Lord, review, Richie Blackmore, Roger Glover. Bookmark the permalink.